Having accompanied his patron Philip of Burgundy to Rome in 1508–9, Jan Gossart was one of the first artists to disseminate the Italian style in the Low Countries. 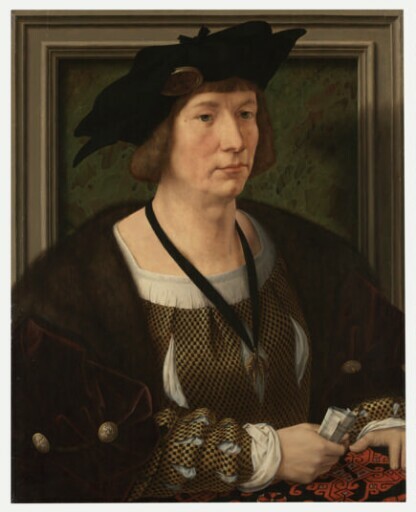 The subject of this portrait is Hendrik III, Count of Nassau-Breda (1483–1538). An esteemed statesman and captain general, Hendrik was entrusted with the education of the Emperor Maximilian’s grandson, the future Emperor Charles V, who appointed him governor of Holland, Zeeland, and Friesland in 1515. In keeping with the meticulous attention to detail of the northern schools, Gossart carefully renders the textures of the carpet, fur collar, buttons, and checkered black-and-gold doublet, creating an image of jewel-like intensity. The count wears the pendant of the Order of the Golden Fleece, the elite chivalric order dedicated to the defense of the church. The sitter’s features are finely delineated (the underdrawing is visible around the lips, nose, and chin) to achieve a sympathetic likeness. The marked illusionism of the work, with the fictive frame and figure’s shadow cast against the feigned green marble backplate, derives from the great Flemish master Jan van Eyck. Gossart’s close study of Italian art is evident in the imposing bulk and balanced composition of the figure. Hendrik III was an adventuresome and noteworthy art patron. An Italian visitor’s diary remarks on the beautiful pictures he saw in Hendrik’s palace in Brussels in 1517, including Hieronymus Bosch’s Garden of Earthly Delights (Museo del Prado, Madrid), which the count very likely commissioned. purchased by (Thomas Agnew & Sons, Ltd., London) for £4,620. Ernst Rosenfeld, New York, by 1930.